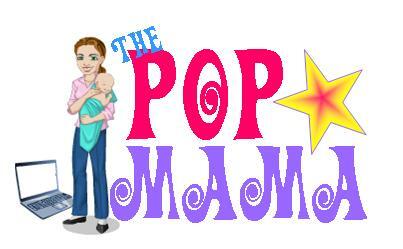 Pop Mama: I'm so hip. I was a big fan of the show Up All Night when it first aired, but now in season 2, I think they have jumped the shark a little bit and the story line is struggling. Basically, Ava's show got cancelled, they got rid of Jason Lee's character and although the writing is still good, the plot has fizzled. Anyway, I was catching up on it last night (it is basically my DVR filler) and it was the episode where Reagan and Chris steal their neighbor's babysitter. I hear this happens, but I have never done it (nor have I had the opportunity to, since my mom is typically our go-to babysitter). So, towards the end of the episode my husband turns to me and says, "Hey isn't that girl the smoothie lady from Fresh Beat Band?" He was talking about the actress playing the pilfered babysitter and he was dead on right. I knew that she looked familiar, but couldn't place her...yep, she also plays Melody on Fresh Beat Band. It was incredibly satisfying and SAD to realize this connection. Clearly, Nick Jr. is on too often at our house. I have found myself absentmindedly humming "It Was a Great Day." Is anyone else watching Parenthood? Does anyone else think that there are too many things going on and that it is becoming somewhat ridiculous? I still really like the show, but seriously, what other major life issue are they going to bring on next and I totally called Amber getting set-up with the soldier...it was too easy. I am also being pounded by campaign calls and sometimes, just to play I answer the polls differently if I get more than 1 call in a day. What can I say, I'm a tricky Ohio "Walmart Mom" (but I typically shop at Target). It has been a big week so far at our house and I am a bit discombobulated... Henry had ear tubes put in on Monday morning (at 7:30am - oy) and Cameron started climbing out of his crib. The ear tube surgery was no big deal and seeing as how it was our third time doing this (Cam had two sets), we were like old pros. The worst part was just leading up to it -- getting the pre-op physical done and then actually waiting at the hospital for the procedure. We had to get there by 6am...and we did, lattes in hand. So, Cameron started climbing out of his bed. I knew that this would eventually happen, but for the longest time he wore a sleepsack, which acted as passive restraint and deterred the act of climbing. Then, he started saying "No sack," and we relented. He stopped wearing it months ago and only just now figured out he could get out of his crib. On Sunday morning he showed up in our room at 6:30am saying, "I got out of my bed." Yep, you did you little... Anyway, I went on a mission to get a toddler bed immediately and found a very nice Little Tikes race car bed on craigslist. We picked it up Monday afternoon and he has been raving about it ever since. Now, let's just hope he stays in it! We are trying a nightlight/alarm clock that is a stoplight that goes to green when it is time to get up. He has "obeyed" it for two mornings now and I am praying that the novelty doesn't wear off. Fingers crossed. 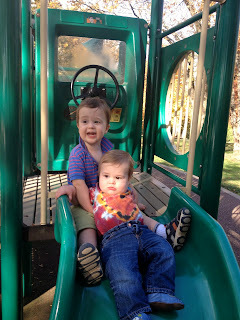 Today is abnormally warm (around 80 degrees), so we went to the park this morning to play. 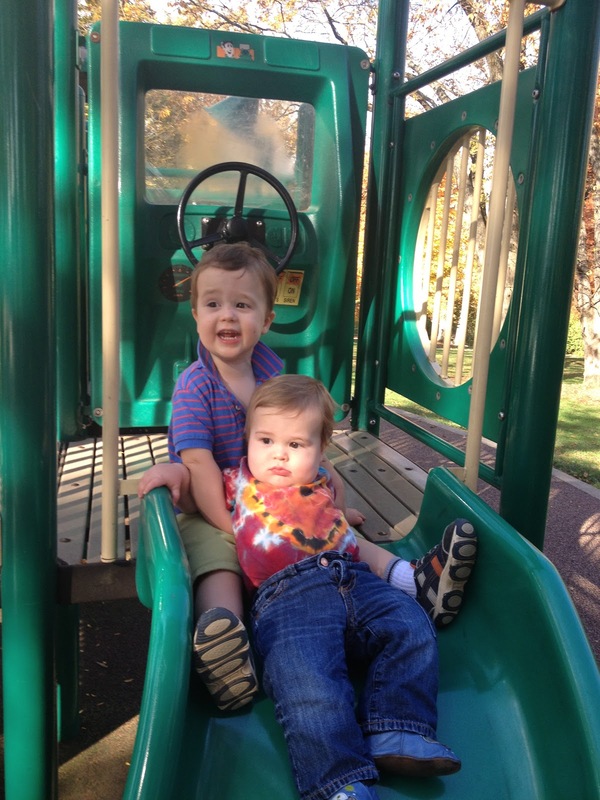 My boys love the slide! Could Henry get any bigger? He is 10 months old, 24 pounds and walking. Although Henry adores Cam, I am anticipating the day when Cameron takes away one of his toys and Henry just decks him. The other day Cameron took all of the toys away from him and I said, "Cam, that wasn't very nice, what is Henry going to play with?" Cam looked at me and said, "Henry can play with a shoe." I had to cough in order to hide my laughter. What a clown.